self defense or the defense of others. 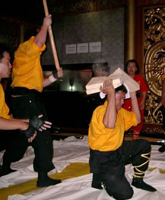 The style of kung fu taught at Yarn Yee Tong Kung Fu Academy is Chow Ka (Jow Ga, Chow Ga), a style created by Chow Loong and his four brothers. 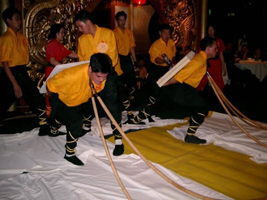 The Chow Ka style incorporates the best techniques from the Hung Gar, Choy Gar and Buk Siu Lum styles of kung fu, the strengths of each style making up for the weaknesses of the others, emphasising efficient movements, simultaneous attack and defense, and control of both inner and outer strength. A ‘form’ is a predetermined series of movements, intended to simulate a battle and help students practice techniques until they become second nature. Mastering a kung fu form is more than just memorising the movements; each technique needs to have strength, proper stance and correct execution. The length of time that it takes to perfect a form is dependent on the ability of the student. After learning the stances, new students will begin with Sup Jee Moy Fah Keun (’Ten’ Character Plum Blossom Fist), a short form with basic techniques. Later forms get progressively harder, and require a greater level of concentration and self-discipline. All students are required to have mastered the first two basic hand forms before learning any weapon forms, as they require a certain level of skill and self-discipline. Sparring sets are similar to forms in that they are made up of predetermined moves, but are performed with one or more other people. Their purpose is to familiarise students with performing the self defense techniques on a real opponent. Sparring sets can be performed both with and without weapons. Free sparring aims to improve speed and the ability to predict an opponent’s movements, and react accordingly using techniques practiced in forms and sparring sets. Students may only participate in free sparring after they have demonstrated correct technique and self-control, and only under the supervision of Sifu Quyen or advanced students. Chi Kung translates to ‘air achievement’, and is the technique of controling breathe and ‘chi’ (air/life energy) to enable the body to do things beyond its normal capacity. Chi Kung can be used for healing purposes, or used in demonstrations such as bending a spear or steel rods on the throat or the famous Iron Palm and Iron head techniques.